Time is getting nearer for the new Moto Guzzi California 1400 to become a reality! More spy photos are circulating as the anticipated launch begins to approach. We expect to see the real motorcycle before end of this year. 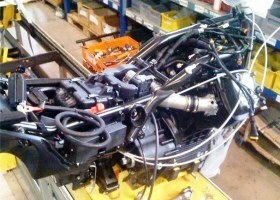 This is a big deal to us Moto Guzzi enthusiasts since the new larger engine will be a major milestone in Guzzi v-twin engine evolution. One interesting aspect of the California 1400 concept motorcycle shown below is the more aggressive cruiser styling that Guzzi seems to be going for. Will this alienate some Guzzi enthusiasts? The photo of the suspected production California 1400 in Vintage black and white touring trim is much more appealing to me as a California Vintage owner. My initial impression is that I am looking at my bike on steroids, with muscle popping out below the tank and defined, sharper lines rather than the soft round look of the 2006-2012 models. What is not to like about this bike? Now I am interested! It is possible of course that some may be unhappy with this modernization, but my guess is that it will bring more riders to consider getting into the brand, but only as long as the dealer network is in place to support it. That’s been a lacking ingredient as many know. But it seems work is being done on that. 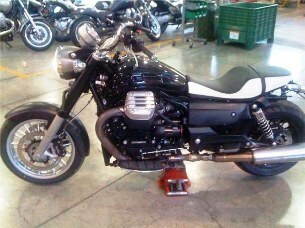 For example, I noticed Matthews Fun Machines in Charlotte NC is now a dealer for Moto Guzzi. They have been an Aprilia dealer for some time, as well as several other brands. I’ll have to pay them a visit. 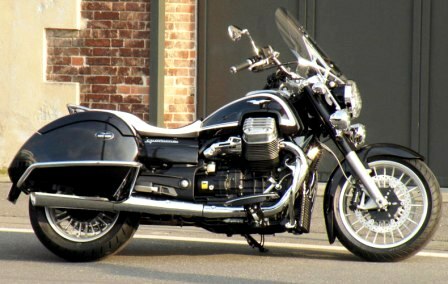 A large cruiser is not something Moto Guzzi has had in quite a while. Large used to be 1100 cc. In fact, that still is large in reality, but as the other cruiser manufacturers have competed for motorcyclist’s attention with ever increasing engine sizes (as silly as that may be), Moto Guzzi had no horse in the race . The cruiser category remains big business in the USA, although the customs have been dropping like flies while smaller, lighter and more affordable priced bikes are becoming fashionable again due to the dull economy. Moto Guzzi is climbing a big hill to be able to get a bite of American motorcycle market pie. Piaggio has a good taste of it already with Aprilia motorcycles, which from my experience, people generally have head of, or may have known someone that owned one. Moto Guzzi, not so much yet. It has been decades since Moto Guzzi hit gold in the US, and from the looks of things so far, this new California 1400, in addition to the excellent lineup of V7’s, could slingshot the brand forward. This formula has worked before and certainly could work again. The 1960’s to early 1970’s Moto Guzzis continue to be sought after by American motorcycle collectors and enthusiasts. The Ambassador and Eldorado are names the older guys remember fondly here. Those old bikes used by many police departments, especially in California, are still very cool today. I certainly am excited about the new Moto Guzzi California 1400, not just because of the mechanical details of the bike, but because it shows the brand is building momentum and still has a serious backing by Piaggio. Sure, it is different in many ways than my 2007 California Vintage, and other modern era Californias that I personally like so much. Will I buy one? If money decisions like this were only that simple, it sure would be nice. I’ll certainly test ride the 1400 someday and I look forward to reporting on my impressions of that as soon as I can. Update: The California 1400 launch took place at EICMA show shortly after this article was written. His description of starting his Guzzi California V11 in the cold was a bit dramatic. However, it clearly relayed the passion that Moto Guzzi owners share about their motorcycles. He’s right. Moto Guzzi motorcycles have “descended from Italian Air Force biplanes of The Great War”. To summarize the Moto Guzzi California Vintage so far, it is like a best friend. I somehow feel as if I have always had this motorcycle even though I have only had it a short time, but it’s always exciting to think about and to ride. It is smooth, comfortable, and easy. Not everyone has one and it is not the same as any other motorcycle. John, I too am excited about the intro of the new 1400. What few pics I’ve seen so far don’t turn me off at all! The fact that this bike will be powered by a “big block” ,the likes of which Guzzisti have never had before, only aids in whetting my apetite. After all, like so many of us motorheads have known all along, “There’s no substitute for Cubic Inches”! There have been a few times;ie. two up, pulling a long grade, against the wind, that I’ve longed for more horses on my Titanium. This may be just the ticket. I will see the new California at 15th November in Milano. Looking forward to it.